A Warner Brothers Picture in glorious Technicolor! 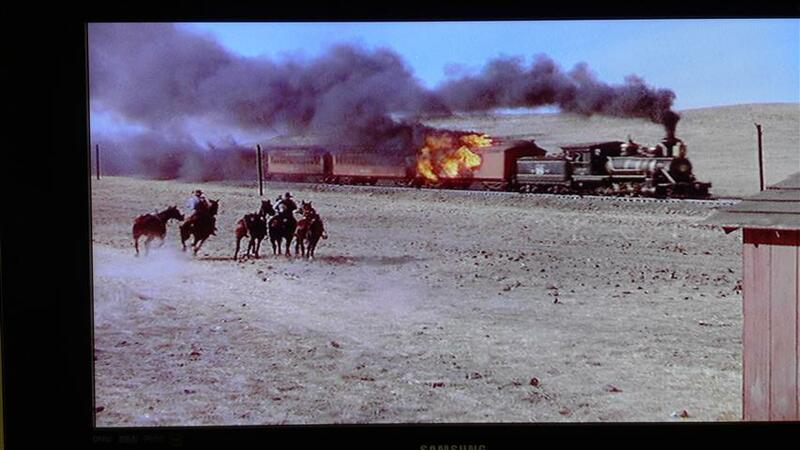 Wrapped around this classic Errol Flynn western are some spectacular train scenes. 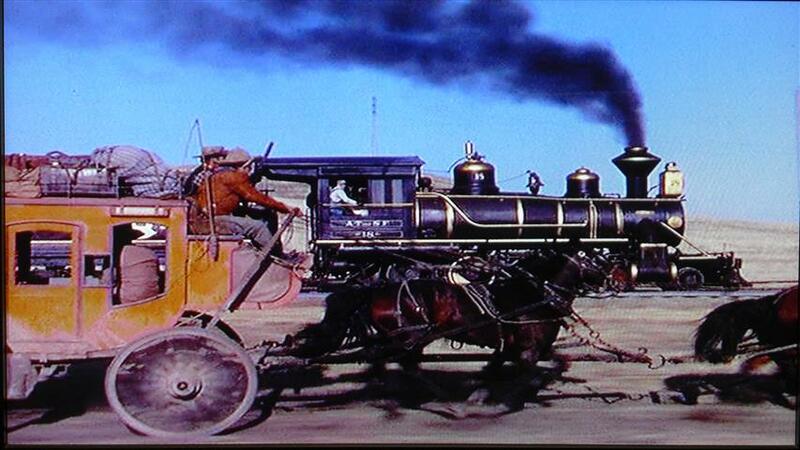 The movie opens with a Santa Fe (AT&SF) steam-powered passenger train’s race with the rival stagecoach. Sierra Railroad 2-8-0 #18 poses as ATSF #18 pulling 3 brightly-colored orange/red trim passenger cars. 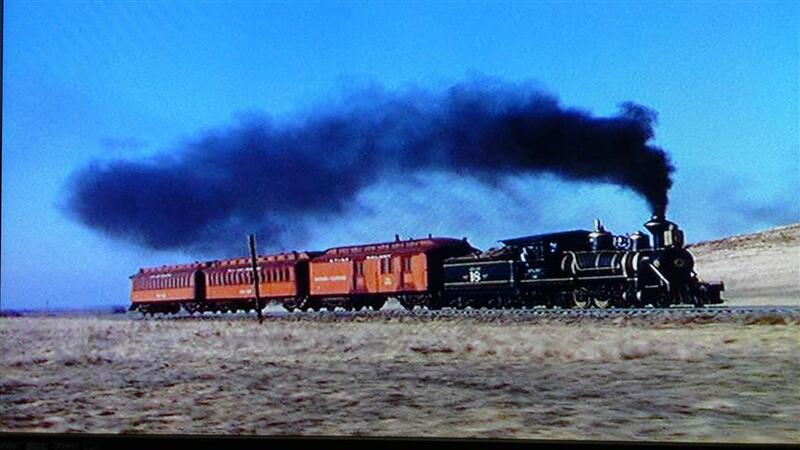 Santa Fe #18 roars along in 1866 Kansas. The steam train pulls ahead. Later, we see the train pull into the station and hear Colonel Dodge give a speech from the back platform of one of the coaches. Later on, Errol Flynn and the evil Jeff Surrett (played with a wonderfully-menacing smile by Bruce Cabot) have it out in the stockyards with a steam locomotive and stock cars nearby. 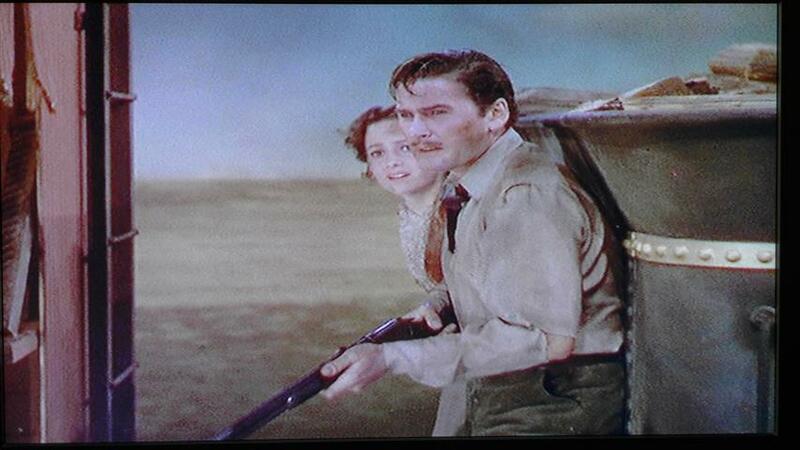 The vast majority of the film is Errol Flynn escorting a wagon train and cattle drive, meeting Olivia de Havilland and being hired as the town’s sheriff. 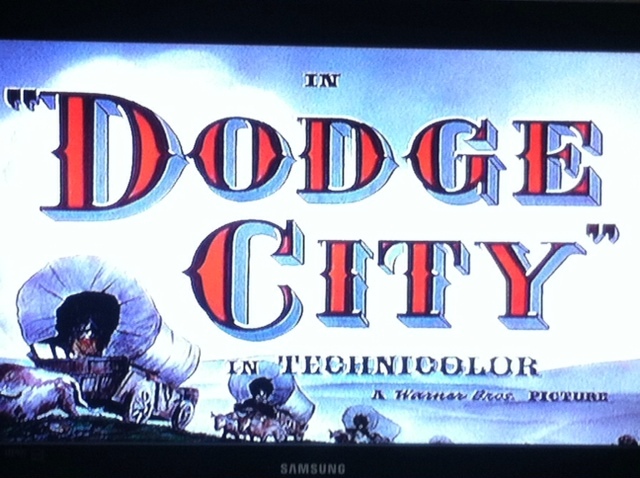 Flynn then sets about cleaning up the lawless Dodge City (along with his many trusty deputies including Alan Hale). Needless to say, the inevitable barroom brawl is one of the most stupendous action scenes put on celluloid. Head for the next water tank as fast as you can! In the movie’s finale, one of Surrett’s henchmen is being taken to Wichita to stand trial. The bad guys board the train to spring him and in the baggage car gunfight with the good guys, manage to set the car on fire (they knock over a kerosene lantern). The bad guys try to make their getaway on horseback from the train, but Errol (with Olivia by his side) manages to pick them off one-by-one with his trusty Winchester. Sheriff Errol saves the day and wins Olivia’s hand in marriage. In summary, this movie is a little thin on train scenes, but what did make it into the film is sensational. Dodge City is definitely worth an evening’s entertainment. This entry was posted in Uncategorized and tagged Alan Hale, Atchison Topeka and Santa Fe Railroad, Dodge City, Errol Flynn, Olivia de Havilland, Santa Fe Railway, Warner Brothers, Western movie. Bookmark the permalink.